David Bollier: What is “value” and how shall we protect it? It’s a simple question for which we don’t have a satisfactory answer. This theory of value has always been flawed, both theoretically and empirically, because it obviously ignores many types of “value” that cannot be given a price. No matter, it “works,” and so this theory of value generally prevails in political and policy debates. Economic growth (measured as Gross Domestic Product) and value are seen as the same. B. Should We Even Use the Word “Value”? IV. COMMONS-BASED PEER PRODUCTION: A FUNDAMENTAL SHIFT IN UNDERSTANDING VALUE? The absence of a credible theory of value is one reason that we have a legitimacy crisis today. There is no shared moral justification for the power of markets and civil institutions in our lives. Especially since the 2008 financial crisis, the idea of “rational” free markets as a fair system for allocating material wealth has become something of a joke in some quarters. Similarly, the idea of government serving as an honest broker dedicated to meeting people’s basic needs, assuring fairness, providing ecological stewardship and advancing the public interest, is also in tatters. Bauwens said that his work in fostering peer production communities is an exploratory project in creating a new type of “value sovereignty” based on mutualism and caring. An important aspect of this work is protecting the respective community’s value sovereignty through defensive accommodations with the market system. “The peer production system lives a dichotomy,” explained Bauwens. “It is based on contributions for which we don’t get paid. We therefore have to interact with the market so that we can earn a living and get paid for what we have to do.” Maintaining a peer community within a hostile capitalist order requires that the community “create membranes to capture value from the dominant system, but then to filter it and use it in different ways” – i.e., through collective decisionmaking and social solidarity, not through the market logic of money-based, individual exchange. …. One participant, Ina Praetorius, a postpatriarchal thinker, author and theologian based in Switzerland, asked a provocative question: “Do we need to use the word ‘value’ at all?” She explained that as an ethicist she does not find the word useful. “Value is not part of my vocabulary since writing my 2005 book, Acting Out of Abundance [in German, Handeln aus der Fülle]. It’s perfectly possible to talk about the ‘good life’ without the notion of value.” Praetorius believes the word “value” is useful to merchants and economists in talking about money and markets. But it has little relevance when talking about ethical living or the human condition. Again, the value/values dichotomy cropped up. Economics claims the word “value” for itself while everyone else, in their private and social lives, may have their own personal “values.” This rift in thinking and vocabulary is precisely what this workshop sought to overcome. Economists are eager to protect their ideas about “value” as money-based and make them normative. Commoners and others, by contrast, want to broaden the meaning of the term to apply to all of human experience. This conflict prompted Ina Praetorius to conclude, “Language is politics.” For herself, she has no desire to contest with economists over control of the term. Others, however, are determined to continue that very struggle. The conventional economic definition of “value” has a significant rhetorical advantage over other notions of value/s. It can be encapsulated in numbers, manipulated mathematically and ascribed to individuals, giving it a tidy precision. Value defined as price also has an operational simplicity even though it flattens the messy realities of actual human life and ecosystems. It purports to precisely quantify and calculate “value” into a single plane of commensurable, tradeable units, as mediated by price. Through discussion, workshop participants set forth a rough alternative theory of value based on a radically different ontology. This theory sees value arising from relationships. Value does not inhere in objects; it emerges through a process as living entities – whether human beings or the flora and fauna of ecosystems – interact with each other. In this sense, value is not fixed and static, but something that emerges naturally as living entities interact. “In a commons, value is an event,” said Silke Helfrich of the Commons Strategies Group. “It is something that needs to be enacted again and again.” The difference between the standard economic theory of value and a commons-based one is that the latter is a relational theory of value, said Helfrich. According to Nick Dyer-Witheford, this idea aligns with Marx’s thinking. While some observers say that a Marxist theory of value ascribes value to things, Dyer-Witheford disagreed, noting that “Marx condemned the idea of value inhering in objects as commodity fetishism. He believed in a relational theory of value – the relations between workers and owners – even if Marx may not have considered the full range of social relationships involved in the production of commodities.”…. The report deals with a wide variety of other issues related to the “value question”: Can abstract metrics help build a new value regime? How shall we value “nature”? Should we attempt to de-monetize everyday life? 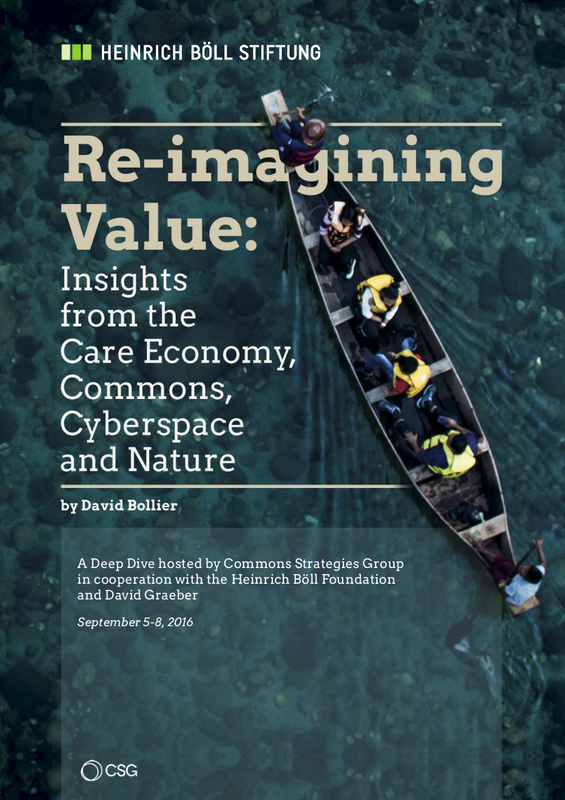 The report also includes a major discussion of commons-based peer production as a fundamental shift in understanding value. This point is illustrated by open value accounting systems such as those used by Sensorica, and by organizational experiments in finance, ownership and governance. While workshop participants did not come up with a new grand theory of value, they did develop many promising lines of inquiry for doing so. Each prepared a short statement that attempted to identify essential elements for a commons theory of value. (See Appendix B in the report.) We hope that the record of the workshop’s discussions will help stimulate further discussion on the question of value – and perhaps bring forth some compelling new theories.